Product information "Double Relay Switch"
With the Double Relay Switch classic electrical installations such as ceiling and floor lamps or fans are integrated into the Z-Wave network and made steplessly adjustable. With the flush-mounted wireless module, almost every smart switch and every electrical device can be steplessly controlled to your needs. The difference between the Double Relay Switch and the simple relay lies in the switching load: The double relay distributes the load over two inputs. 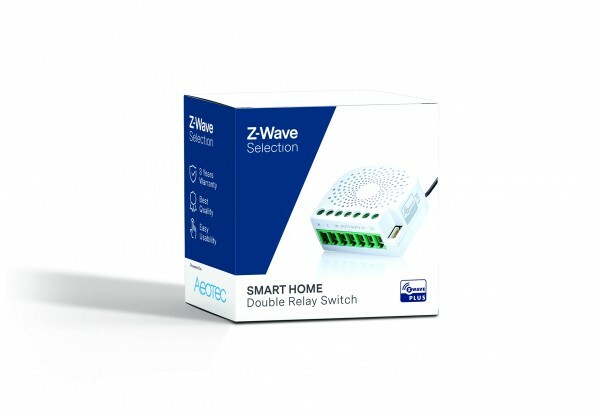 With this switch, you can integrate various switchable, non-dimmable electrical installations (such as ceiling lights, sockets ...) into the Z-Wave network. This makes it possible to switch the connected consumer both wirelessly via Z-Wave, as well as locally using the existing wall switch. In addition, the device has an energy measurement function that can be used to determine the exact energy consumption of the connected consumer. The compact wireless module is placed in a wall box directly behind the conventional switch and transforms there already standard electrical installations into intelligent Z-Wave-based systems. The existing switch now no longer switches the load directly to the consumer, but only supplies a control signal to the Double Relay Switch, which in turn controls the load. This control is done either via the local switch or via z-Wave. The flush-mounted module works with every series of switches and every design, provided there is enough space in the junction box for installation. In large 65mm deep boxes this should be the case regularly. In smaller boxes (for example, 45 mm), the possibility of use depends on the required depth of the conventional switch as well as the space requirement of the possibly also located in the box electrical connector. The compact wireless module is placed in a wall socket directly behind the conventional switch and transforms there virtually every standard electrical installations into a smart installation within a Z-Wave based systems. The Double Relay Switch distributes the load to two inputs compared to the simple relay. Related links to "Double Relay Switch"